Ancient Mi'kmaq petroglyphs spring to life thanks to artist Alan Syliboy. During a recent trip to Cape Breton, Nova Scotia, I had the chance to meet celebrated Mi’kmaw multi-media artist Alan Syliboy. Syliboy—a passionate man whose primary work is inspired by ancient Mi’kmaq petroglyphs found throughout Nova Scotia—was selling a series of hand-painted elk skin drums. I fell hard for one drum that featured a fanciful image of a young boy with tree branches sprouting from his head. “Little Thunder”—pictured above—is the main character in Syliboy’s recently published children’s book, a coming-of-age story (derived from the Mi’kmaw legend The Stone Canoe) about a boy and the art of thunder-making. As a young man during the 1970s, Syliboy often visited a series of petroglyphs located in Kejimkujik National Park and National Historic Site—located about two hours from where he grew up in the Truro, Nova Scotia-based Millbrook First Nations community. 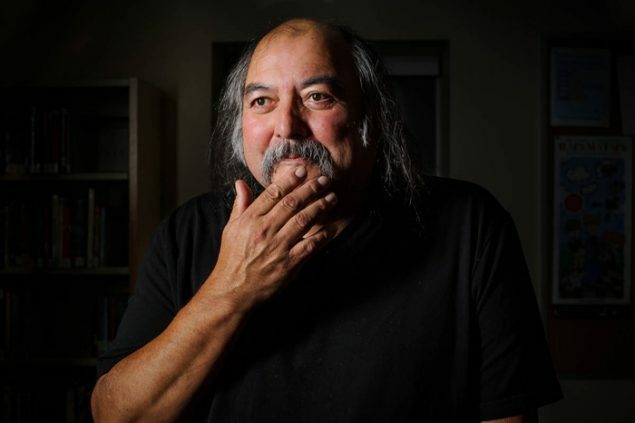 First contact with Europeans began 400 to 500 years ago and has, over time, he explains, eroded the Mi’kmaw nation’s link to their ancestors and culture. “We lost 90 to 95 per cent of our population. We were down to a few hundred people. We were just about extinct. 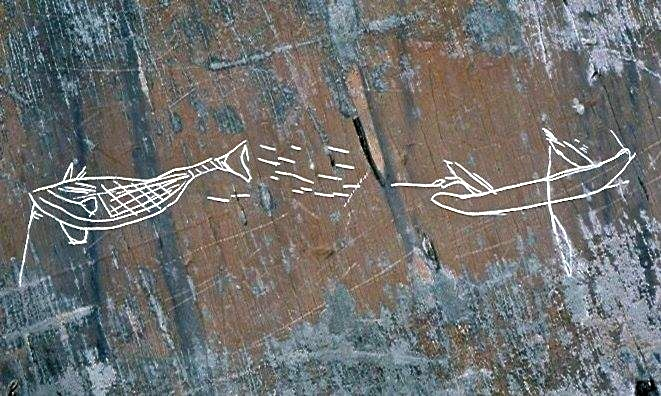 I want to bring to life these old stories and make people aware of who we are,” says Syliboy, whose work also features whimsical, petroglyph-inspired depictions of whales, canoes and caribou. Aside from being one of his community’s most notable artists, it turns out Syliboy is a musician, as well. In fact, his band Alan Syliboy and the Thundermakers will be headlining at this summer’s Stan Rogers Folk Festival (June 30-July 2). Truth be told, the same could be said of Alan Syliboy. Yes, his art is captivating. But so, too, is the man himself. Editor’s note: Mi’kmaq is the plural form of the singular word Mi’kmaw. Click here for more information on the usage of Mi’kmaq and Mi’kmaw. What a treat to read this wonderful story about Alan Syliboy and to see his magnificent work. 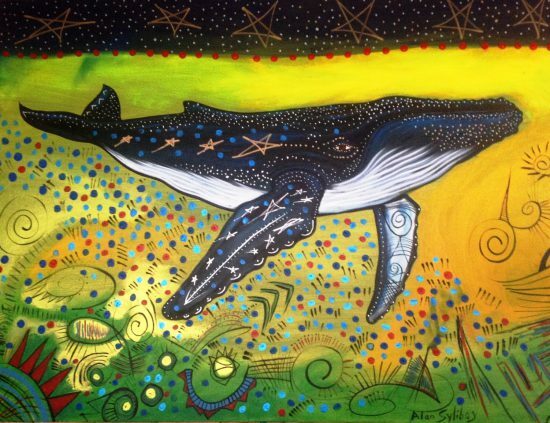 On this cold and dreary day in Kelowna I was particularly taken by his joyful painting of the whale – truly a gift! Thank you for the info. I was wondering ’bout how he made his art. 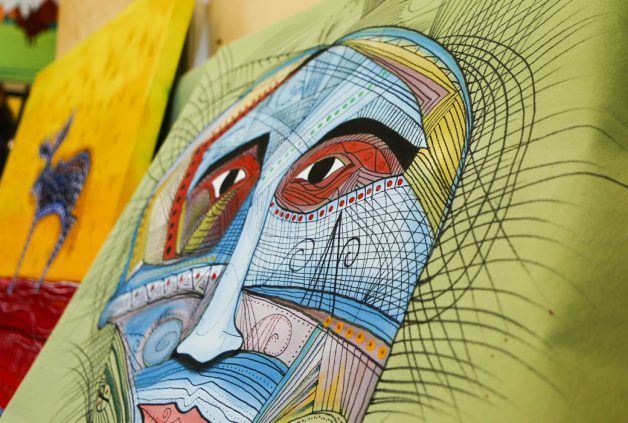 I’m doing a Native project at school and want to know how he made his art and what materials he used. Thanks a lot!